Programme Director Curation and Culture at London College of Fashion Shaun Cole shares what fashion books are on his bookshelf waiting to be read. I have two books on the go at the moment. The first is Artist, Rebel Dandy: Men of Fashion, the book written to accompany the exhibition of the same name at The Museum of Art at Rhode Island School of Design. Having spoken with one of the curators while she was preparing the exhibition and being particularly interested in men’s fashion, I really wanted to see the show, but time and flights were against me. However, having the book is offering a great compensation. Published by Yale University Press it is of the quality that I expect from YUP and as such is lavishly illustrated in colour (like the other recent YUP books that are sitting on my shelf waiting to be read – Caroline Evans’s Mechanical Style, Judith Clark and Amy de la Haye’s Exhibiting Fashion Before and After 1971, and Valerie Steel’s edited A Queer History of Fashion -to which I contributed). While the term Dandy has been over and sometimes inaccurately applied to men and men’s fashion, this book offers a set of scholarly essays that situate the dandy by the curators – Kate Irvin and Laurie Anne Brewer - as well as Christopher Breward and Monica L. Miller, alongside a series of fifteen vignette musings on particular dandies such as Oscar Wilde, W.E.B Du Bois and Sebastian Horsley. The images of details of men’s clothing marry well with the written essays and musings. The book provides a very welcome addition to the increasing bookshelf of works on men’s fashion, both historic and contemporary, and I will certainly be using it in my teaching on men’s fashion in the future, as well as poring over the images of such elegant wardrobes. 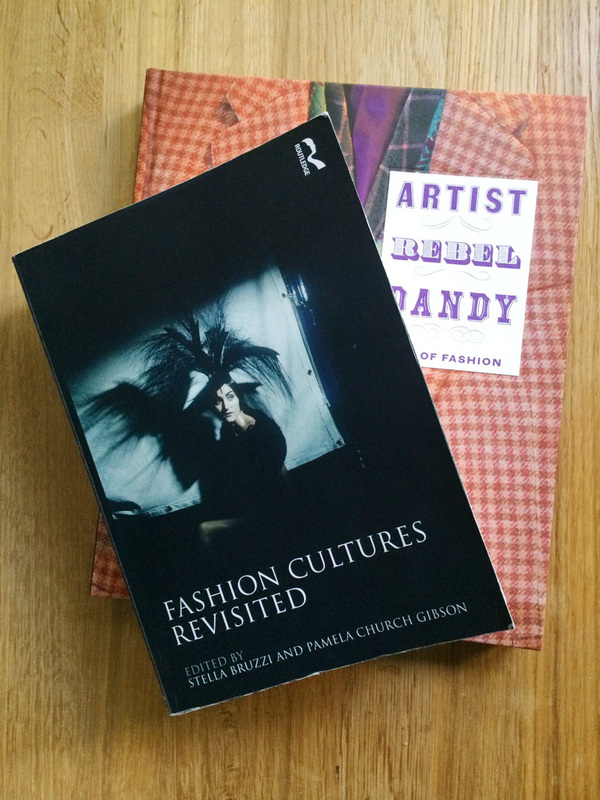 The second book is more scholarly; Fashion Cultures Revisited edited by Pamela Church Gibson and Stella Bruzzi (the keynote speakers at the most recent Costume Society Study Day held in October ‘Shooting Style Fashion on Screen’). Developing and expanding on their invaluable 2000 work Fashion Cultures this book considers how the landscape of fashion has altered in thirteen years. This new volume uses some similar section headings as its predecessor to address areas such as shopping and spaces (now updated to include globalisation), fashion imagery and media, and icons, and indeed some of the authors from the original Fashion Cultures appear again revisiting similar topics or how the relationship between fashion and culture (in its broadest sense) has altered over the thirteen years between volumes. What is significant in this new book is the inclusion of a section on production - demonstrating a renewed interest in this aspect of the fashion cycle -, ‘contestation, compliance and feminisms’ (significantly in the plural reflecting developments and considerations) and, for me the most exciting and like Artist, Rebel, Dandy, ‘making masculinities.’ Fashion Cultures Revisited contains 400 pages of insight, reflection and opinion on almost all aspects of contemporary fashion and while I am reading it now for the first time, cover to cover, I am sure I will be coming back to it again and again as I consider these different areas of the growing field of dress and fashion studies.